March 8, 2013 by Verle L. Bell, M.D. 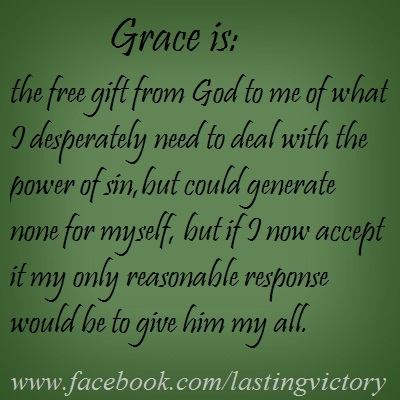 Grace is: the free gift from God to me of what I desperately need to deal with the power of sin, but could generate none for myself, but if I now accept it my only reasonable response would be to give him my all. Mercy helps me benefit from the consequences of sin, Peace allows me to get out of works and rest in the middle of a sin filled world. GRACE helps me rise above the power of sin by faith as an eagle is lifted by the winds of the storm. Grace is available and has come upon all men. Most will not accept it or live in it’s power because the natural man HATES AND FEARS GRACE! If all my worth power and security come from God, period! no exception, none from myself—- then I can never feel superior to anyone, my life is not my own, “my rights” makes no sense, I fear the loss of identity which I tend to get from what I do. I fear the loss of motivation which I now derive from bragging about my works and comparing myself to others and from earning people’s praise. I fear the loss of control of others, since it would not longer make sense to motivate them with shame and fear. Truthfully, the sensation of having these things is an illusion. I will loose all of these illusions and be blessed by loosing them. If I really understand my debt and the power of GRACE, I find infinite motivation, humility, peace, identity, ability to motivate others. I find God defending the rights he has given me. I gain all that I thought I would loose only to find I never really had them. I AM NO FOOL TO GIVE UP WHAT I ONLY SEEM TO HAVE (self generated worth strength and security) IN ORDER TO GAIN WORTH STRENGTH AND SECURITY THAT I CAN NEVER LOSE AND WHICH IS INFINITE. I get up in the morning and see what lies ahead and how I usually react to these events in damaging ways. I then appropriate the GRACE to catch myself and yield my members instruments to God to see, feel, think, act and rest his way instead. LORD HELP ME TO QUIT RUNNING FROM YOUR GRACE, TO ACCEPT IT AND REST IN IT’S POWER AND BEAUTY. This entry was posted in Uncategorized and tagged BIBLE WORDS EXPLAINED, Christianity, Divine grace, God, Good works, Grace, Religion and Spirituality. Bookmark the permalink.